The origins can be traced back to 8 March 1942 when Cyril Smith gave the first of 31 concerts that were held from 1942 to 1946 (with a stunning array of artists). These concerts culminated in the formation of the Ilkley Concert Club at an open meeting held in the Ilkley Playhouse on 8 April 1946 and the first concert was given by Denis Matthews on the 28 August 1946 …..and the rest is history!!!!! Is this how you measure success?!! 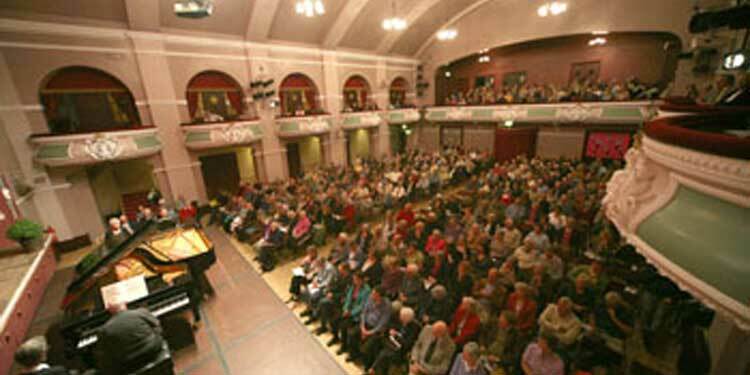 The 73rd Season is the 36th consecutive season that Ilkley Concert Club has sold all available season tickets to subscribers – an amazing achievement reflecting huge credit on our President, David Pyett. Fortunately David continues as a committee member with special responsibility for programme planning (just try to stop him, as our Chairman said!!). The club is vibrant as every year about 5-10% of subscribers join as new members. However, do not despair if you are not a season ticket holder because seats are always available for individual concerts and we also have a tradition of Concert Club Members letting us know if they cannot attend a concert so that their tickets can be made available for re-sale.